While working with a client the other day, I hit upon this amusing way to conquer your inner critic. Well maybe not exactly conquer? More like avoid getting swamped by? It’s all about Mr. Bunny here. He’s a great example of how that inner critic (gremlin, monkey mind, whatever) works — it focuses on distracting you, big time! 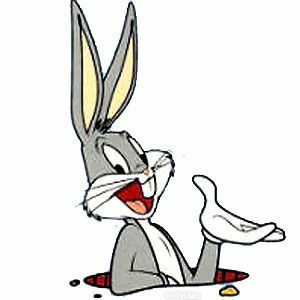 Think about all those cartoons where Bugs drives Elmer and others wacky with distractions, interruptions, and wild antics. The result is that the object of all this behavior just cannot think straight or function. And that is exactly what your inner critic wants. It wants to keep you safe by not having you do ANYTHING different. After all you are currently safe, right? You are not, in this moment on fire, so you must be safe. What I’m pointing to is that your critic has an exceptionally narrow criteria for safety. As long as you are not in imminent danger, it does NOT want you to do ANYTHING different. Guess what — the best way to keep you from doing something different is to distract you! First, it’s about the distraction technique of taking you down a rabbit hole. Changing the subject, fussing about some detail, even getting angry — all examples of ‘falling down a rabbit hole’. If you can imagine Bugs pushing you down that hole, it just might give you the idea of avoiding the hole! Second, it’s all about the ‘Yeah, but…’ technique, which to my ears sounds amazingly like or at the very least rhymes with “Wabbit”. You remember Elmer Fudd saying: ‘You wascally wabbit!‘ The ‘Yeah but…’ happens when someone has an idea. Before the idea can actually get any traction the critic instantly blurts out a ‘Yeah but…’ Yeah but we don’t have the money for it. Yeah but it will be hard. Yeah but you’ve never done it before. Yeah but…on and on it goes! The result being more distraction to take you off course, to stop you from getting anywhere close to going after your dreams or goals. What if when you said: ‘Yeah, but…’ you could picture Elmer and the wabbit (yeah/but) in your brain? It just might grab your attention long enough to help you recognize the ‘yeah, but’ as the distraction it is designed to be. Here’s the bad news: Sorry, our critic voices are not going away — AND — you CAN choose to not let them overtake you and run your life! A very effective way to do that is with humor. Our inner critics want you to take them seriously. And one of the techniques they use to help that along is to get you seriously distracted from anything that might result in you doing something new and different. Humor is a very effective way to interrupt the critic’s game! Frankly, my job and goal is to help you actually leap into doing something different because as the old adage goes: ‘You can’d keep doing the same thing over and over and expecting a different result.’ See if a bit of Bugs can’t help you create new and different results! If you’d like some help in avoiding your own rabbit holes, just give me a call at 503-258-1630 or check out my website at www.sensiblecoaching.com. This entry was posted in inner critic and tagged distractions, inner critic, Yeah but on November 22, 2017 by Shell Tain. Your Business Is YOUR Partner! Stay In Touch. Join my list. I won’t send you something more than once a week. Your info stays with me. Period. ©2019 $ensible Coaching, Inc. All rights reserved.